This building was originally an old movie house built in 1910. 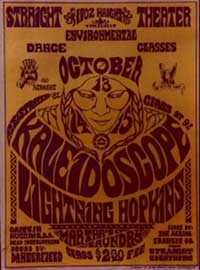 For a little time in 1967 it was a hippie owned and operated venture. Many people contributed time and money to put it all together. Acid king Augustus Owsley Stanley installed the public address system, hippies sanded the floors to incredible perfection.The Dead used the place to rehearse for a long time long before it opened. It opened in July 1967. That first week-end was quite a show. Quicksilver Messenger, Big Brother and the Holding Company, Country Joe and the Fish, plus the Charlatans. When the Straight Theatre lost its dance hall permit they called it a dance studio and the Dead became the dance instructors. Santana who was just starting out played the Straight Theatre and what a great night that was. A very groovy place while it lasted!